Today we spent the day over in Sunnyvale (Silicon Valley) running errands and visiting our old friends in the area. Haven’t seen Alex & Nadine in about six years, and their son is now a boy of nine! He and Emma had a raucous good time laying waste to their house, while the adults caught up. A: We shoot with two cameras, a Nikon D70 (digital SLR, 6 megapixels), and a Kodak DC3400 (digicam, 2.1 megapixels). The Nikon does all the heavy lifting, and the Kodak is primarily Emma’s camera, but Eleanor borrows the Kodak for family photos. I also prefer the Kodak for bad environmental conditions, like blowing sand and salt on the beach. Q: Do you do any post-processing? A: No. I don’t have any post-processing software, and if I did, I wouldn’t have time to use it. I barely have time to shoot, sort, and post them on the Internet as it is. Q: Do you shoot at higher resolution than you post on the web? I’d like to use one of your photos as my desktop, or print it. A: The Nikon photos are shot at 3000×2000 pixels. I upload them to the Flickr Photo Album at 800×600 because otherwise it would take too long. But once in a while I post a picture at full resolution so you can have it for your computer desktop, or make a nice print. When I do, I’ll put the tag “desktop” in the Photo Album description on Flickr, so you can find it. Q: How do I see a higher resolution image than I see on the blog? A: Everything is stored in the Photo Album. 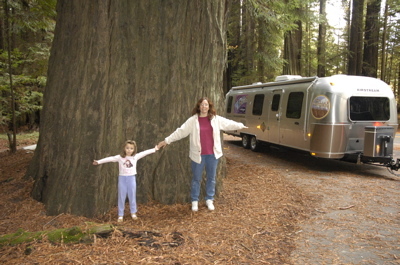 Click on the “Photo Album” link, or visit www.flickr.com/photos/airstreamlife . Once you are there, click on any picture for a larger version. For most, you can click again on a link to the lower right corner of the page which says, “See different sizes.” This will give you some options. Q: Can I use your photo for (fill in the blank)? A: All my photos are licensed under a Creative Commons “Attribution-NonCommercial-NoDerivs 2.5 License.” This means you can feel free to download the photos and use them for non-commercial purposes, with credit to Airstream Life magazine. For commercial use, contact me. Q: How do you get such great photos? A: (1) Shoot a lot. (2) Know the camera. (3) Travel to beautiful places (4) Delete most of what you shoot. This morning we said goodbye to Tim and his family and hit the road (I-680 to be exact) down to Saratoga, where we had planned to camp at a county park. Before we left, Tim gave me this photo of him and I posing in front of the Tour Trailer. What a studly pair of guys, eh? He also had a nice shot of Eleanor and I being interviewed for the podcast last night. We talked about life on the road, homeschooling, budgeting, planning, and the differences between our travels in Vintage Thunder and this new Safari. Eleanor was a natural and she’s got a nice radio voice. I never noticed that before. She wasn’t even nervous. It will be a great program when it airs. You can check it out at TheVAP.com. Tim’s going to have to do a lot of editing of that interview. At a few points on the recording you can clearly hear Emma talking very loudly downstairs about something. Next time I suppose we’ll have to include her in the interview! It was good we had a short trip planned, because one of “those situations” occurred. We got to the County Park, which was only 9 miles from the center of Sunnyvale — a technology hotspot. I figured we’d have no problem getting good cell phone service and Internet there. Wrong! We were up in the mountains somewhere. My Verizon phone barely worked, Eleanor’s Sprint phone didn’t work at all, and our Internet box just shrugged and gave up. Worst of all, there was a sign which alerted us that the gates to the campground would be locked at sunset. They don’t provide campers with the gate code, so we’d be unable to go anywhere (or get back home) after 5 pm! Pretty ridiculous. It’s quite cool even here. Today was barely in the 50s and overnight it is getting into the 30s. I suppose our friends back home won’t shed a tear for us, since it is snowing there, but for Californians, this is cold. And when I see frost on the Airstream in the morning, my motivation is to head further south. So last night I made our reservations for our desert home in Borrego Springs, which I’ve added to the Schedule page. If anyone wants to cross paths, you’ll find us there by New Year’s Day. We’re already making plans to meet up with a few people. The more, the merrier! Thanksgiving was an unqualified success. 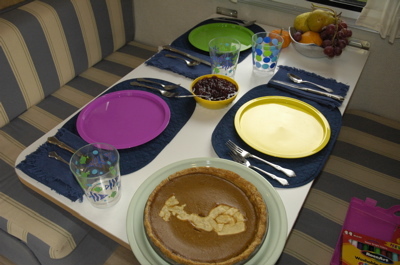 Eleanor masterfully cooked both a pumpkin pie and a turkey with stuffing in the Airstream’s oven, as well as green beans with onions and almonds, mashed potatoes, butternut squash, and cranberry sauce. Emma helped. We’re still eating the leftovers for lunch and dinner two days later. I love leftovers, like turkey breast sliced on bread with mayo and lettuce. We left the park in Benbow to drive south to Sonoma valley. Since we got a break by picking up our mail in Eureka earlier than expected, we had time enough to stop in Sonoma before our scheduled visit in Suisun City. Friday night found us wandering up a dark narrow twisting road to the Sugarloaf Ridge State Park in Kenwood, which is just north of Sonoma on Rt 12. The campground is more than 1000 feet above the valley, and it was quiet, nearly empty, and very cold overnight. 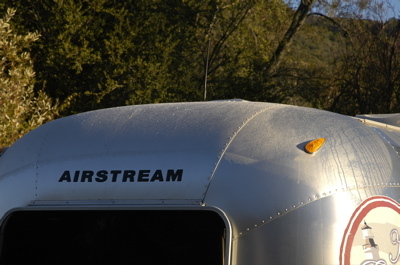 I woke up to find the Airstream and the Nissan coated with frost. Our furnace ran a lot during the night and so our battery was depleted by about half (no electric in this campground). The grape vines have turned red and gold now, and they make for terrific scenery from nearly every hill and turn. I wished I could have stopped more times for photos, but unfortunately Rt 12 has no shoulder much of the way. Although it is known mostly for wineries, Sonoma is an interesting historic town with a state historic park right in the middle of downtown. There’s a Mission, barracks, and hotel worth taking a look at it. Emma, however, was most interested in the giant prickly pear cactus right in front of the Mission … and when she picked up a downed pear she found out exactly why they are called prickly. Fortunately the thorns worked their way out eventually. 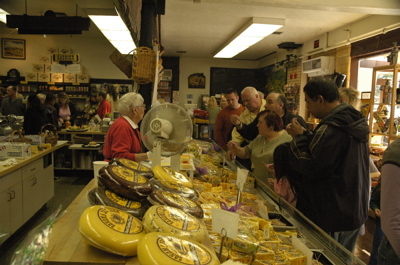 One fun stop in Sonoma is the Cheese Factory, where they were handing out samples of various cheddars and the crowd was waving and pressing for bits like a gang of bond traders in an up market. Although we had plenty of samples, lunch was in the trailer (a turkey leg and stuffing, yum). Someone pressed their nose to the window and was astonished to see us inside. People are always fascinated by the trailer. We invited her in and gave her family a quick tour before departing. Our next stop was Tim Shephard’s house, located between Sacramento and San Francisco. Tim is best known as the producer of TheVAP, a podcast about Airstreams. You can check it out at TheVAP.com I’d done an interview with him last summer which was on Episode 3 (I think) and now we had the chance to meet and do a joint interview with Eleanor about life on the road. It will probably air in December or January. Happy Thanksgiving to all our U.S. readers. This is probably the most unusual Thanksgiving I have ever had, but it is fun. We weren’t wild about our campground on Wednesday night so we drove slowly about 30 miles down the rest of the Avenue of the Giants this morning and then set up here at a commercial campground. The major draw of this spot was (1) the campground was open, unlike our first choice, the Benbow Lake State Recreation Area; (2) it has free wifi. Our cell phones have not worked much since we left Eureka, and Internet access is only a dream along the Redwood Highway (Rt 101). So even though this is the most expensive campground we’ve paid for since we started this trip ($31), it was a good choice for today. Also, Eleanor needed full hookups for Thanksgiving. She has a degree in Culinary Arts from Johnson & Wales, and she is a serious cook. You don’t mess with Eleanor’s cooking. This is her Big Thing, so plenty of propane, electricity, and water were mandatory. 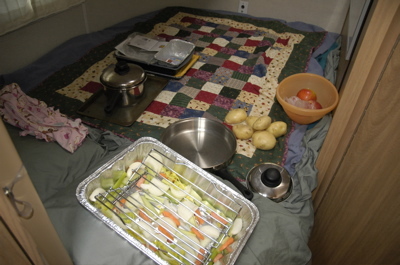 I can’t complain — the trailer already smells nice from the cooking. Last night Eleanor and Emma made a pumpkin pie with a tulip design on it (by Emma), and now gravy and stuffing are being made. The entire trailer except the bedroom has been pressed into service. The dinette is set, Emma is on the credenza stirring something, her bed is covered with food that has been prepped, the kitchen is of course completely occupied, and I have been banished to the bedroom (when I’m not being asked to take out the trash or some other stereotypical male task). We have a lot to be thankful for. We have each other, the freedom and the ability to travel, family, and health. 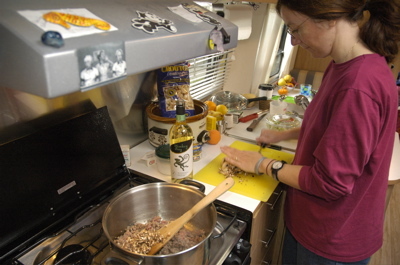 We have Eleanor’s spectacular cooking today, and the new friends we made just a few minutes ago who are parked nearby in their new Airstream Quiksilver Edition. We are thankful for our friends and fellow Airstreamers who support us with their emails, calls, and comments on this blog. On this day I won’t worry about the money I don’t have, the things I don’t own, the opportunities I may have missed, the mistakes I have made. This is a day to reflect on the things that are good in our lives and appreciate the pieces we may have taken for granted. Whatever you have to be thankful for, I hope you can recount them and appreciate them today. Eleanor asked me if I would lose my interest in the big trees if we lived here. I don’t think I would. They keep surprising me, and I keep wanting to explore every little redwood grove we see. And there are dozens of groves, many of them marked with little signs and tiny pull-outs so you can hike among them. I got up early again to do some business over at the Ray Jen cafe, got the oil changed in the Nissan. Because we are towing a lot, I am trying to stick to a schedule of 3,000 mile oil changes. In the afternoon, we basically hung out waiting for Jonathan and Shelby to show up with our new faucet. They showed up around 2 pm and Jonathan made quick work of the faucet while Emma and Shelby played a game. Now our water problem is entirely solved. It was a dash from there to Eureka, 90 miles south. We had just enough time to make some quick stops, one at the Elk Prairie Campground Visitors Center (and yes, there are really a LOT of big elk roaming around there — wish I’d had a telephoto lens), and another stop at the Redwood National Park headquarters to get our national parks pass stamped. I was utterly amazed when we pulled into the Eureka post office at 4:54 pm, the day before Thanksgiving, and managed to pick up our forwarded mail in less than 4 minutes. We had expect we’d miss the post office and have to camp in Eureka for a few days. With this bonus, we decided to press on for another hour and get a little further south because we need to be in Suisun City (300 miles from here) on Saturday. It’s a drag when we have to be on a schedule. I would have liked to explore the old downtown of Eureka and see the famous Victorian houses. But the compensation is that we spent another night camping among the redwoods, just off the famous “Avenue of the Giants” that parallels Rt 101 in Humboldt County. Sorry for the repeated delays in posting. We are wrestling with Internet access and other communications issues. Crescent City is a place where our phones “roam” and the fog is dense, so we don’t get voice mail notifications, our mobile Internet doesn’t work, and dropped calls are commonplace. So I have to post when I get a chance. Tuesday morning I woke at 3:30 a.m. for no good reason at all, except I suspect that the Ray Jen Cafe, where I am getting my Internet fix, put regular coffee in the “decaf” Hazelnut I ordered the night before. Returning to sleep was impossible so I got to work at about 5 a.m. on the dinette, and then headed over to Ray Jen again at about 8 a.m.
Mid-day we headed out to the Ewok village, um, excuse me — I mean Stout Grove, a particularly famous area of Redwoods nearby. 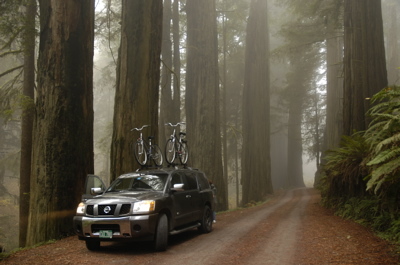 The road itself is an adventure: one lane, twisting between massive redwoods, enveloped in fog … downright magical. A few miles down, we parked and hiked through Stout Grove and beyond. 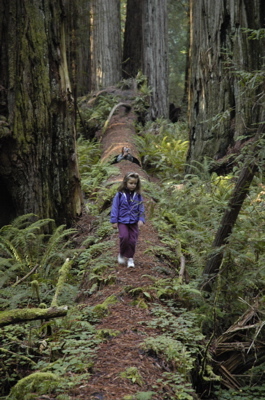 Here’s Emma walking along a downed redwood, probably 300 feet long. It was probably over 700 years old when it fell. If you are in the area, this is a hike to take. The Stout Grove trail and the little extension we did was an easy two-mile roundtrip along the river, with endless beautiful scenes. I didn’t spot any Ewoks, though. I wish I could report the day we wanted to have, hiking trails among the giant old-growth trees, but one of those unfortunate situations cropped up. I suppose in seven weeks of travel we had to have one systems failure, and this was it. When we turned on the water last night, the kitchen faucet sprang a leak. 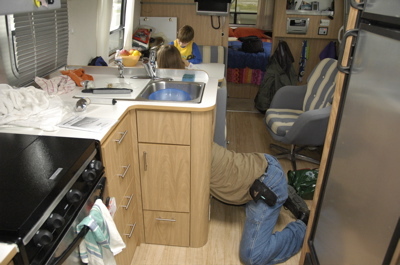 This wouldn’t be a major occurrence but there is no shut-off for the kitchen faucet, so the only way to stop the leak was to turn off the water pump, and that meant the entire trailer had to go dry. We patched up the problem as best we could with tape and a bucket, but realistically we had to get it fixed before we could continue to enjoy the trip. Jedediah Smith SP is one of those marvelous places where cell phones do not work, and so our only means of communication with potential repair assistance was via a single payphone across the campground. But at least we could make a few calls in the morning to ascertain our options. Fortunately, everyone was helpful. The nearest Airstream dealer was 250 miles away in Sacramento, but Airstream said, “We can’t leave you without water in the middle of your trip, so get it fixed wherever you can and send us the bill.” The camp host provided the business card of a good local mobile RV repair service and graciously refunded us our second night’s camping fee. We drove out to nearby Crescent City and met Jonathan the repairman at the local Wal-Mart, where he arrived with his 5-year-old son Shelby (who was bearing a Star Wars light saber). 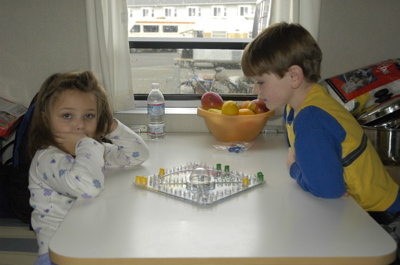 Emma and Shelby quickly began to play together and we chatted with Jonathan while he diagnosed the problem. The problem required complete replacement of the Moen faucet, but since Moen offers a lifetime warranty, we were able to call Moen to have a new unit shipped to us. We had to pay an extra $12 for FedEx to get it here before Thanksgiving, though. Jonathan removed the bad faucet, capped off the lines so we could once again pressurize the system, and we were off again ““ sans kitchen faucet. We’ll meet Jonathan again on Wednesday when the new faucet arrives, to complete the repair. With all that, we needed to revise our plan. We decided against going back to the State Park, since we will probably need to make some more calls over the next couple of days, so we are now parked at a commercial campground near the harbor. 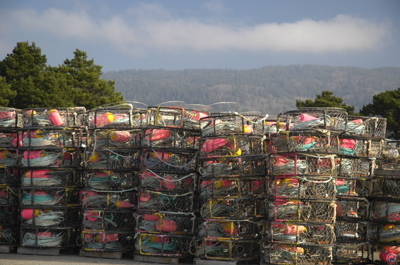 It lacks privacy, ambience, and trees ““ a bit of a “Wal-Mart on the water” ““ but at least the location is central: to our west, a working harbor with barking sea lions; to the south, surfers practicing in the small waves; to the north, fishing boats, and stacks of crab traps; and to the east past the hotel strip, a twisting road through the redwoods, where ““ as everyone in town has told us ““ they filmed the Ewok village scenes in one of the Star Wars movies. No wonder Shelby has a light saber. It’s a local industry, sending tourists out to see the Ewok village.